Until today I didn’t even know I owned such a thing, let alone the discomfort it could cause if it was tight. Over and above sports massage and liberal application of deep heat, does anyone know a suitable course of treatment / likely period of rest / general tips, to get rid of the bloody thing? Stretch it as if doing an Achilles stretch put turn your foot onto its side until you feel it stretch. 3x15secs three times a day. Often it will just disappear like that. If its only mild pain, I usually run through it. Interesting, thanks. My pain is localised to the knee area. I'd previously self-diagnosed the issue to be ITBS and worked for a week to fix that. Sports masseuse tells me otherwise. Very tight (and this morning as a result of massage, painful) below knee on outside of lower leg. Are the same stretches still suitable? also just thought, i think peroneus longus pain tends to be towards the ankle (although i could be wrong). Right, I've cribbed below pic from US Runners World website where same issue was discussed back in 2010 and no resolution found. I can ping about the place without issue; up / down stairs and then all of a sudden out of nowhere, sometime when static, the ache presents itself. I've stretched everything and foam rollered IT but the issue seems only to hide for a short while. I want to avoid taking a hack saw to leg out of frustatioin. Any clues / leads most welcome! When you say you have "foam rollered IT" by IT do you mean your IT Band or the muscle you indicated? MM ... calf, soleus, ham, quad and gleuts being stretched twice daily. IT and now piriformis being foam rollered and I've recently found on t'internet a video on how to stretch the peroneus longus. The knee ache seems to have subsided somewhat, although it occasionally produces cracking/snapping noise suggesting something is still awry and tenderness at top of peroneus longus (directly below knee) remains ever-present. maybe just a case of time, gentle stretching, ice & massage. I use zero drop shoes and had to switch to shoes with more built up heels until it was recovered so as not to overstretch it. It's a real b*gger. I tend not to eat particularly healthily, which running / triathlon training tends to counterbalance, however, forced rest combined with the associated "blues" isn't fun. Regardless, thanks for contribution. I shall continue to hope that the peroneus longus messiah might still appear. Hi, I also have the same issue and would be interested to hear how it turned out for you. Ignore the diagnosis, find out why. I suffered with it in my left leg last year from January to May. I managed to run a bit within that time but no more than 5k distances. From May onwards it's been fine but now I've got the same pain in my right leg! It's so frustrating. I've had physio both times - around 7 sessions last year . He did massages and accupuncture and recommended the foam roller. To be honest I don't know whether those sessions helped at all, I think it was ultimately the back step from running that helped. I'm seeing a different physio now for the right leg and he has advised me to do strength exercises for my legs and glutes as he thinks it's a muscle imbalance or poor biomechanics. i feel bad for you Eric as it sounds as though you have suffered with it worse than me. I just hope my right leg clears up like my left did! Definitely rest is key - I continued to run through the pain last year and it just got a whole lot worse and would hurt every day constantly. I have not had a MRI. Neither physio ive seen has mentioned that. I have done lots of reading and you are right - everyone says something conflicting! I am hopeful that the strength training exercises will help me. Mine hurts after running - usually starts to hurt a couple hours afterwards. At its worst it would hurt every day and would get remarkably worse as soon as I started running. 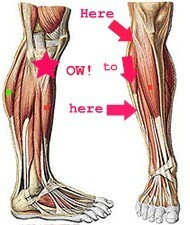 Hi would lovecto know an solutions, my injury sounds very similar and the pic above shows exactly where the pain is. I can run for about 3.5 miles before 'bang' it explodes in pain and i cannot run through it. I'm so frustrated as all I want to do is run! Rest ....... Word from hell! Honestly this is s problem that dates back almost 2 years. However this last episode with is enough to stop me running completely is since a marathon back in September. How do you know when it is healed enough to run? As much as you'd prefer not to, the best solution I can provide is to take a break from running, especially since peroneal tendon injuries have a tendency to turn particularly nasty if they're not afforded sufficient R&R. Eric, I'm sorry to hear that you continue to remain troubled by your peroneals. I hope that you eventually find a solution. While peroneal tendon injuries don't necessarily prevent you from cross-training, Louise, running is definitely best avoided during your recovery, in order to reduce the accumulation of scar tissue within the tendon. In addition to wholly understanding your sense of frustration, I also appreciate the reasons behind why you seek a quick solution to your current problem, Louise. Sadly, peroneal tendon injuries can take months to repair, especially if you’ve attempted to continually run through the pain and discomfort. Exactly a year ago, after landing awkwardly upon the outer edge of my right foot, I was under-going treatment for an acute injury to the area of the peroneal tendon beneath the ankle. During my four month period of rehabilitation, I underwent a course of manipulation designed to break up the scar tissue that had accumulated. However, it took around 2 months of regular manipulation (both painful and ticklish in equal measure) before I began to see any improvement. Since the tendon initially failed to respond to treatment, the suggestion of an air-cast (to completely immobilise my foot/tendon) and surgery (to cut away part of the injured tendon) were options considered by my physio. As I’ve said, depending upon the degree of damage, peroneal tendon injuries can turn nasty. Thankfully, the options considered weren’t needed, as the tendon eventually responded to manipulation. However, during my period of rehabilitation, the location of the injury prevented me from performing certain calf exercises in the gym. For example, I could use the StairMaster without discomfort, but use of the calf-press machine left me feeling as though my tendon was ripping itself apart. As such, the size and definition of my calves did somewhat suffer in late 2014. However, I considered the larger picture, in addition to appreciating that I had to be patient and allow the tendon time to heal. Thankfully, following a four month course of manipulation and a relatively subdued period of resistance work, twelve months on, I’d consider that my peroneal tendon has fully healed since I’m able to perform calf presses without discomfort, loading the tendon with even more weight than I was able to before the occurrence of the injury. Taking into consideration the position in which you find yourself, Louise, I’d recommend that you continue with the course of strengthening exercises that you’ve been instructed to perform, in addition to easing off on the running. It does take time for tendons to recover (a lot longer than we all have the patience for), but a few months of relative inactivity are better than enduring a life-time of chronic pain. Sorry for late reply - my Physio has said my peroneal muscles are being worked too hard because of the muscle imbalances in the rest of my leg. He says i do not have a tendon issue (yet). I also saw a podiatrist the other day who works alongside my Physio. They have said over pronation, very flexible ankles, weak glutes and stiff hips have all contributed to the problem! Exercises I've been given are clam shells (google it and there are videos), calf raises, and single leg squats. goes without saying that these will not work for everyone and you need to see a professional to find out the cause of the pain. Good luck! My first post here - go easy on me haha. Well the descriptions above sound pretty accurate for what I've got, which is a sharp pain just below the knuckle of bone on the outside of my left leg just below the knee. It's grumbled away for a while and got progressively worse over the last six weeks or so (I run 5k twice a week) . At its worst I have to stop running and hobble a bit, especially going downhill. I thought giving it a rest over xmas would help so I haven't run for a fortnight, but then on going for a speedy walk yesterday the pain was worse than ever and that was just walking. So much for giving it some rest! What's also odd is that it goes away just as easily as it comes on. I had a two week period recently when I didn't feel it at all. Even after a run it can just disappear, despite being really painful when walking/running just half an hour earlier. I'm off to a sports physio next week so happy to put on here what I find out, or not! Starting to wonder if I'd be better off cycling and swimming at least in the short term (am I allowed to say that on here haha). I had a problem with this a few years ago. Sports massage helped (was painful!). I also started massaging the peroneal muscles (and the calf muscles) every evening on days I'd run, and the following morning. Good luck with the physio. Hey hoping this is still active! I've just come across this thread and reckon it could be what i've got. It's 2 months since the initial injury and i'm literally no better. Physio was treating me for referred back pain, but i've just seen a sports physio who went nuts on this part of the calf and it hurt like hell - hence me trying to work out why. Can anyone shed any light on recovery time at all or how it was resolved? illewg-any luck on your diagnosis. i've had something similar for years. tried it all with little to no luck. would love to know if you've found anything that brought relief. Apologies but "Peroneus Longus" would've been a good name for a Roman pornstar.